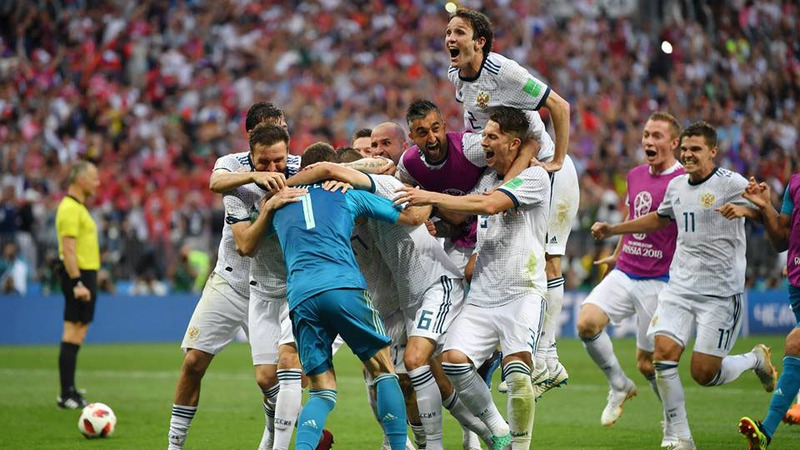 Moscow: Hosts Russia beat Spain 4-3 on penalties on Sunday to advance to the World Cup quarter-finals where they will face either Denmark or Croatia. Goalkeeper Danijel Subasic was the hero as Croatia squeezed into the World Cup quarter-finals with a penalty shoot-out victory over Denmark here on Sunday. Ivan Rakitic stroked home the decisive spotkick to ensure the Croats advanced to a last eight meeting with Russia after the two sides finished locked at 1-1 following extra-time. Barcelona midfielder’s winner came after Milan Badelj and Josip Pivaric saw their penalties saved by Danish goalkeeper Kasper Schmeichel, who also saved an extra time penalty from Luka Modric. But Danes Christian Eriksen, Lasse Schone and Nicolai Jorgensen were thwarted by Subasic in the shootout to ensure Croatia won 3-2 and advanced to their first quarter-finals since the 1998 World Cup.